"Linens Included" terms: Book NOW for COMPLIMENTARY BED & BATH LINENS on ANY reservation in 2019! 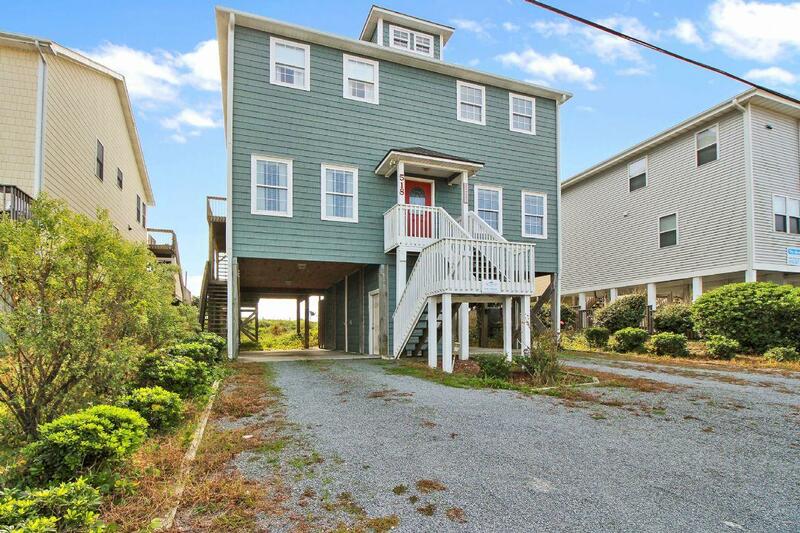 “Surf Monkeys” is a towering five bedroom 5 1/2 bathroom house located in Surf City, just a few blocks from shopping, restaurants and the fishing pier. This house sleeps 14 and features two huge L-shaped decks with panoramic ocean views, flat scren TVs, high speed internet, an outdoor cold water shower and much more. The house also offers complimentary linens. Enter the house through the front door located on the street side and into the lower level which conveniently houses four of the five bedrooms. Three of the four bedrooms have queen sized beds and the additional bedroom has two twin bunk beds. Each bedroom has a private bathroom with stand up shower and flat-screen TV with roku and the Spectrum cable app. At the end of the hall the laundry room can be found with the washer and dryer and also access to the lower deck. Upstairs you will find an open living area with a large kitchen featuring a breakfast bar and huge dining table, perfect for family meals. The comfortable living room provides ample seating and a flat screen TV with cable. The couch folds out to a queen sleeper for even more sleeping accommodations. Off the kitchen, you will also find a half bathroom. The entire area boasts bright airy spaces, ocean views and a door opening up to the expansive top deck. The master bedroom is located on the upper level and provides a king bed, large en suite bathroom with a huge stand up shower, Jacuzzi tub and double sinks. From either of the two decks you have direct private beach access for a quick dip in the ocean, a walk on the beach at sunset or a full day of fun in the sun! “Surf Monkeys” is a truly stunning house fully equipped to satisfy all your needs to enjoy a fabulous, memorable vacation on Topsail Island year after year. "Hi. The property accommodated our clan (3 families w/ 4 grandkids) perfectly! Location and beach access are perfect. We will be back!" "We had no complaints with Surf Monkeys, we only wished we could stay longer. We enjoyed the beach and there were plenty of beach toys, chairs and umbrellas. We cooked wonderful dinners and the kitchen utensils were stocked! "